When temperatures begin to drop, many people notice that their bodies begin giving off signals that they need to adjust to the cooler temps. While dry skin is a common issue, the mouth has its own set of problems that must be combatted in order to make it through fall and winter healthy and unscathed. Perhaps one of the first things that you think of as cooler temperatures begin approaching is that you need to stock up on lip balm. There is a good reason for this! Chapped lips can be a miserable experience and can bother you throughout the day and even while you sleep. Exposure to wind, cold, and even the sun during fall and winter creates the perfect environment for dry lips. The skin on the lips is much thinner and more delicate than the skin on the rest of your body. It will become easily chapped and peel away, leaving the raw and unprotected layer beneath exposed and painful. By being conscious of wearing lip balm with an SPF of 15 or higher, you can avoid the painful experience of severely dry lips as temperatures drop. Cold sores are also a nuisance this time of year. As cold and flu germs become more prevalent during the fall and winter months, exposure to germs is almost inevitable. This may seem a little old fashioned, but being extremely cautious of whom you kiss can greatly help avoid catching cold sores. Cold sores are caused by a virus, and viruses are easily spread through contact. Remembering to wash your hands frequently can also lessen your chance of coming down with a cold sore. Stress also has a cause and effect as it relates to cold sores. While fall and winter holidays can bring about extra stress, making sure you get plenty of sleep and taking needed breaks can help ward off cold sores. It is also extremely important to stay hydrated throughout the cold months. Many times people do not feel as thirsty in winter as they do in the summer, but it is vital that you maintain a regular intake of water. Because there is so much less humidity in the air during cooler months, hydration can be zapped from your body very quickly. By continually taking in water, your skin, lips, and mouth can stay hydrated and ward off unwanted side effects from winter. 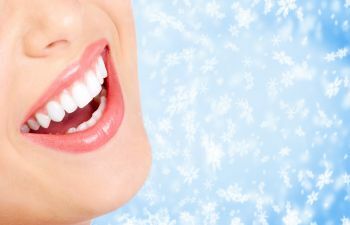 At Gold Hill Dentistry, we care about you and want to ensure that your mouth is healthy year round. Call us today to schedule an appointment.